This is the most exciting project list I have ever got to make. I love gardening and can’t wait to actually get to do some. I’m also thrilled that I get to start my orchard (again since my first attempt failed). This is the list that convinced me to turn my life upside down and move out to the middle of nowhere. 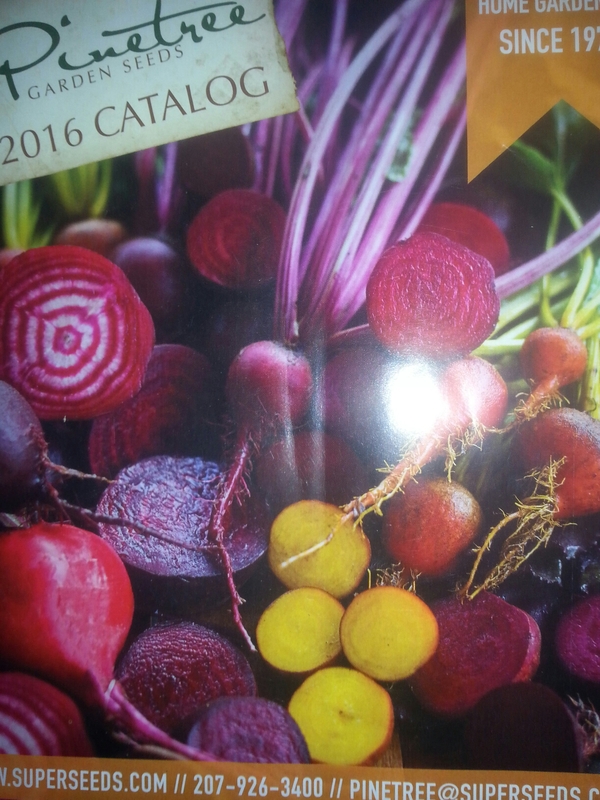 The 2016 Planting List! Annual garden. I have been slowly preparing garden beds with all the branches and small trees that were left behind by the logger. This huge mess has actually left me with a ton of materials. I hope to get a very rich garden going to provide us with food for the whole year. This will be my first attempt at a garden this size, but I will have the need for it, so I should do alright. The kids will be able to help a lot this year too, so hopefully that will encourage them to take part in the eating of the vegetables. I will share more on this later. Orchard. This will be on the list for many years to come. I want to plant a few trees each year and set up guilds around them so that they can grow at optimal levels. The trees I plant this year will incorporated into the annual garden because this will eventually be an orchard only, but this area is the sunniest spot we have and by planting in the garden I have less preparing to do. The trees will be small this year and shouldn’t block any sun from the annuals. By the time the trees are big and do block the sun, we will be getting closer to moving in to the big house and the annual garden will be relocated closer to that house. We will see how this plan actually works. Beneficial bug garden. I have an area near the house that will be a garden just to attract beneficial bugs. I plan to plant some flowers throughout the garden as well, but this will be an area for butterflies and hummingbirds to come so that we can watch them as well as provide them with food. Mosquito garden. This will be a garden around the house to scare the mosquitos away. I will plant various herbs that offend mosquitos so that they will not congregate around our living area. I have already started collecting tires to make planters for the herbs. Herb garden. This is going to be a big deal in the near future for us here. I am very interested in learning more about healing herbs and maybe it will even turn into a source of income for us. I am going to pick a few different herbs that we use now and plant them throughout the garden or in their own spots. I’m new to herb growing, so I don’t really know what to expect. Perennials. These will also be very important to us in the future. These will be planted along the edges of the future orchard which will be the annual garden this year. Again as we move away from the tiny house in to the big house, the annuals will be relocated, leaving the perennials in a rich garden area. The placement of these plants will be as important as the placement of the trees. We likely won’t get much of a yeild from these this year, but once they are established, we will have them for a long time. Yard. We have nothing but clay and rocks right now. I will not be able to plant grass this year, but I will start with planting green manure cover crops to begin to enrich the soil. The main thing I will plant will be clover. This will also provide something other than mud for us to walk through. A couple years of growing clover to enrich the soil enough for us to be able to plant some sort of grass. I hope. Grapevine. I had already started this project, but it will have to be relocated in the spring to the new area that I have started preparing. After the logger went through, it opened up the land to us so that we could really observe our surroundings. I had the chance to rethink my plans and decided that there was a better place to put the grapevine. It is going to become part of the living fence along the outside property line. This will be a tough project because we will have to build an arbor in solid rock. I’m thinking a 5 gallon bucket placed on the rock with cob or something to weigh it down. As always, I am open to any other ideas people may have. We have plenty of logs down to make posts, I just need to figure out how to get them standing. Blueberry Hill. This is going really well so far, but I only have 3 plants started. I have prepared the spot pretty well, I just need to get more plants in the ground. Duck forage. We will end up with a duck pond and of course ducks at some point. All I want to do with this this year is pick a location for the pond and plant some forage for the ducks so that it will be there once we get the ducks. Pea shrubs are on the top of this list. Living fence. This is another one that will be on the list for years. This year I plan to move some of the downed wood to the property line and plant some trees that will do well in the shade that will likely always be there. This should be a quick and simple project. Hopefully I can find enough trees and bushes that like the shade that are also edible or medicinal. I plan to relocate some sugar maples and white pine (free!) which will provide us with sap for various different products like syrup and pine tar soap and shampoo (good stuff). Jewelry garden. I’m planting some gourds in the garden anyway. These can be used for various decorative projects once they dry. There are also bushes and things you can plant whose berries naturally dry into beautiful beads. I am still looking for ideas for this. Bog. We have tons of bog area. I would like to find a few plants that I can grow well in these conditions that will provide us with food or materials. Bamboo may be an excellent option if I can contain it. I’m working on Thanksgiving, so we aren’t really doing anything. However, my job sent me home with a turkey so we decided to see if we could cook it on the woodstove. We cook on it a lot, so it is not very clean and pretty. But it did cook the turkey. Boiled away all day and came out quite tasty, for turkey. We just threw in some salt, onions and garlic and left it alone. Just another chance to work on my wood stove cooking skills! This next year will be my year. This year we had to get established and the man pretty much was “in charge” of what needed to get done and when. I didn’t get to do much landscaping and planting or even cooking for that matter (we ate a lot of simple boring meals). I have a whole goals list for myself as far as the planting is concerned. But the man still has a project goals list of things we need to get done that are much more boring than my planting plans. They are still important so I’ll share the list. I actually put things in order of importance this year so we could be a little more organized. I plan to hang the list so that we can stay on track. Chop wood. This is our number one project for a good reason. Having wood that is not properly seasoned is a huge pain. I’m hoping this gets well under way long before spring even gets here. The man plans on cutting through the winer, which is supposed to be the best time to cut anyways. Cistern. We really need to spend less time going down to the stream to collect water in gallon jugs. This is annoying when it is cold out and you have to get your hands wet. It will eventually be to collect rainwater, but in the interest of saving time early on, we will get some sort of a pump system to fill the cistern from the stream or from one of the many springs we have on the land. We have yet to decide how we are going to set the cistern up so that it won’t freeze in the winter, but we’ll get there. Root cellar. With all the planting I am going to be doing, we need a place to store all the food. We have a tiny house with almost no storage space, so we will have to build ourselves a root cellar. Again, no specific plans as to what we are doing, but we have the winter for planning specifics. I also welcome any ideas people may have or advice on how they built their own root cellar. Outhouse. We need to build a new one. Ours has blown away. This may not ever get done because we do have an indoor bathroom, but it would be really nice to not have to go inside every time we have to go. Saves on emptying the composting toilet too. Outdoor kitchen. Our cooking space this year has been rather annoying really. It worked and we were fed, but we can do better. I have already started constructing a rock wall with raised beds to go around the new cooking area. I have big plans for that garden. It should end up being a nice place to cook by the time we finish. Roof. Our roof will have to be unfinished for the winter. We have been assured that the covering we have on the roof will be fine for this year, but we need to cover it asap. This will also allow us to maybe collect the rainwater off the roof. Wood storage. We plan to build a covered area off the side of the house to keep all of our firewood for the year. Siding. 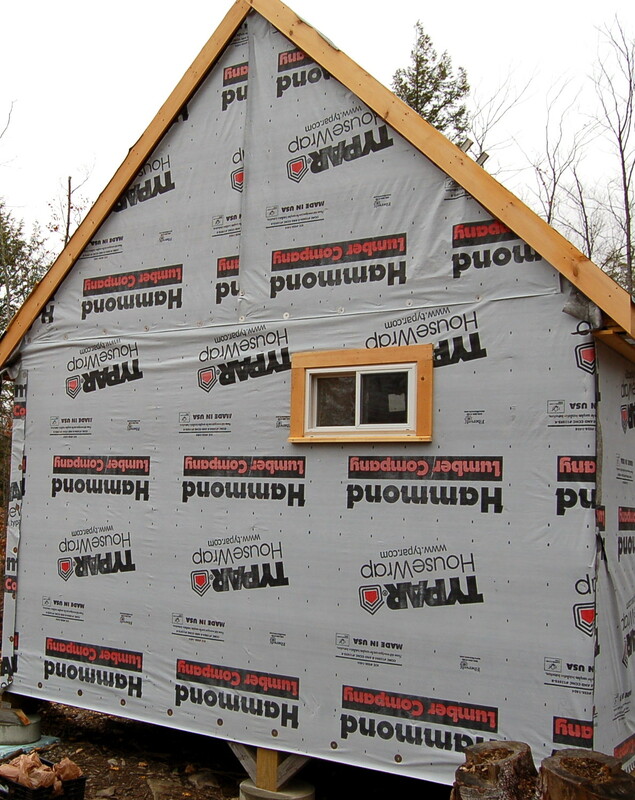 The house currently just has that paper webbing on it to protect the wood. Again, good for this year, but should be taken care of asap. I hope to get an alaskan mill and make out own boards. Maybe we can scavenge some old cedar posts or something like that from Uncle Henry’s. Tool shed. We have outgrown our current tools shed. It has also taken a bit of a beating from us going in and out of it. We need something a little more solid. Playground. The kids are outgrowing their little play area. They need a bigger place to play and don’t really need to be fenced in as much as they have in the past. There are tons of options for natural playgrounds and I hope we have the time to build one for our kids. Observatory. I have mentioned the plans for this before. I doubt we will have the time to finish this, but I hope to be able to at least start it. We are thinking about building it with earth bags, so it shouldn’t even cost us too much. Bug hotel. I had started this project last winter and never really go to put it together. It will likely not happen too early in the year, if at all, but I would really like to try. Outdoor shower. I really loved having the shower outside. I plan to try again with something more solid. I want to build something similar to cordwood, except with beer bottles. I have been saving the bottles in hopes of a good project, this may be it. Cordwood houses often use bottles as windows, I’m hoping to build the whole shower this way. The bottles are dark enough that you won’t be able to see through them, so it may just be perfect. The last goal we have is to clean up the mess left by having the lot logged. The “mess” is actually providing me with tons of materials for many different projects and even some firewood. It is a hefty project list, especially for a secondary project list, but that is it. As always, I know that we can’t get everything done, but I hope to get most of it done. We will see! I have shared along the way all of the goals I had listed to accomplish this year. I have shared at least one that I did not accomplish. I just wanted to show them all in one place and tell you about what we have learned this past year. Put up the wall tent. I am happy to say that it is still standing in pretty good shape. We never did fix that hole we had made. It didn’t let too many bugs in. It is currently being used for storage while we get the house insulated and then some of the stuff we have will get moved into the storage loft. There is no way it will all fit, but we will have to get creative. Build an outhouse. We had a tent outhouse that we used throughout the summer. It worked great, no real issues. However, after we moved into the cabin, we had quite the windy day and the outhouse blew down the hill. I’m fairly certain this tent is not usable ever again. We will likely build a new one in our spare time. Plant a garden. I already shared that this had failed miserably. I think we got two tomatoes. I am, however, still planning on hosting a seed exchange ad rather than exchanging saved seed, I will exchange the extra that I buy this year. I cannot possibly plant all that comes in all the packets. Outdoor kitchen. We had a cooking area. Actually a few. But we never actually put together the outdoor kitchen. I have already started next years attempt in hopes that this will actually happen. Warm shower. We had a warm shower most of the time. We managed to get plenty clean without freezing most of the time. It worked, but I would like to do better. It is on the very bottom of the list for next year, but it is on the list. Cistern. This did not happen at all. We had the stream that we used for our water source, so it was never really urgent to get the rainwater cistern set up. We tried a few times, but it just wasn’t a priority and so did not get done. Root cellar. This never even made it into our heads. We never even considered working on it because we were so busy. I remembered it had been in the plans when I looked at the list to do this post. It made it to the top of the list for next year though. Most of these goals were secondary to building the house. The house took up almost all of our time. We knew this would be the case, but made the list anyways as I always do. Overall, not a bad year. So, what did we learn in all of this? Chop wood early. We had a bunch of cut wood that was siting around, not chopped. We have been fighting with burning wet wood since we moved in to the tiny house. It is very frustrating. We are not locals and the locals have known this fact since they were kids. This will not happen to us again. The man plans to start getting wood together over the winter for next year. We are also going to finally be buying a few cord of wood this week. We had to wait until the finances had lined up right. Either way, we are warm. Houses take time and money to build, no matter how small. We underestimated the time and money aspect of the house. We assumed as much, but when it is staring you in the face, this is a different ball game. We made it through just fine, a little frustrated, but fine. 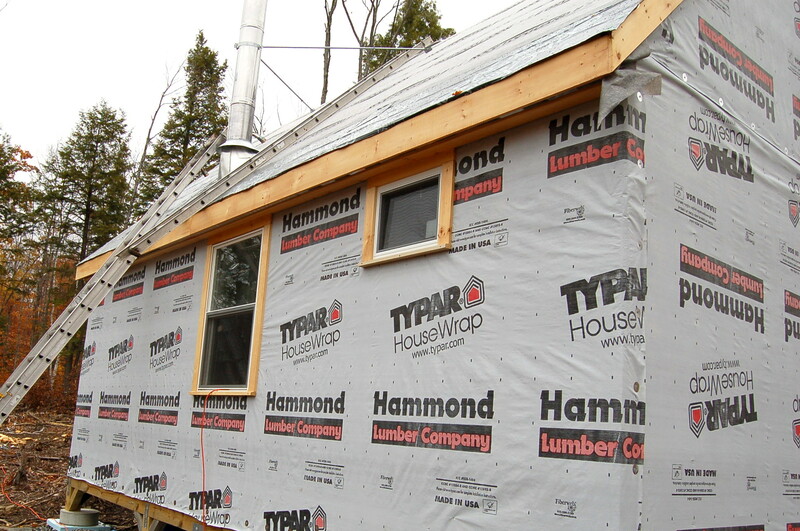 We do plan on building a bigger house, but it will be of materials we gather as much as possible which will save money and it will not be a rushed project. We are living in a house now, not a tent, so there is no need to rush. Living out in the sticks is a very different experience. Being off grid makes that even more different. You learn to watch the weather and plan around it. You have to be aware of how much water you have. You have to store much less food since you don’t have a fridge. I’m sure many of these things will get easier as we get established, but we have worked harder this year than we ever have in our lives. It is still all worth it. It is beautiful out here. Life is getting easier every day. The more we get used to our new lives and the more we build our home (including the lot) the more we are able to enjoy it and maybe even relax. Yesterday, we noticed that we really only have a couple more things we need to do NOW before we can take it easy. Sure, we have to do the inside of the tiny house and cut next years wood and deal with the snow when it comes, but we are almost settled in to a comfortable point. It feels amazing. This is mostly what we have been up to lately. I should say what the man has been up to. We are playing catch up on lost time we had put in building. We had no chance to cut firewood. 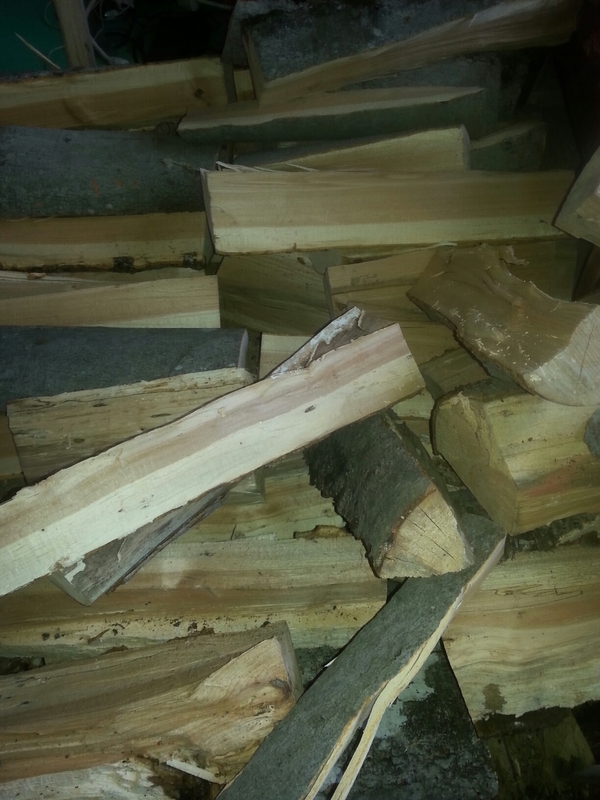 Luckily I just got a new, better paying job and we are soon able to buy some nice, dry firewood. I have been putting a lot of time in to preparing garden beds. That will be a post with a ton of pictures coming soon. I’m waiting to take the pictures until the last minute because I’ll be working on it until the snow comes. We have been lucky so far in that area. When it gets too dark to work, I sit and inside and read. Lots of tough choices to make. I’m buying quite the variety this year and so I will have plenty to share. Hopefully in a seed exchange. I can’t share saved seed since I didn’t get a garden in, but I would still like to trade some. I hope to host an exchange in February on seed exchange day. Yes, it is a proclaimed holiday! I have failed to host this exchange a couple times now, but intend to keep trying. Leave a comment if you are interested and I’ll be in touch for sure. That’s all for now. Happy Autumn! 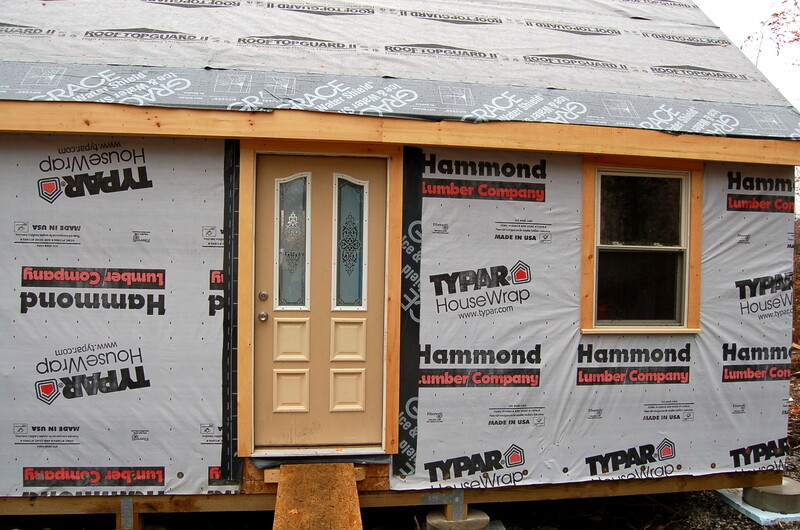 We have all the windows and the door in place! I hope to add on a couple more windows when we can afford it. This is it for now. It sure beats the plastic we had wrapped over the openings though. A little view out our back window. The leaves are falling and the mountains coming in to view!